Urinary incontinence or the loss of ability to hold in the urine in your body can be embarrassing and inconvenient, interfering with your daily life. If you are looking for natural ways to overcome it, exercise can make a world of difference, improving symptoms and helping regain bladder control. This problem can affect your self-esteem as well as your ability to function normally at home or in the workplace. It can also hamper your activity levels and mobility in general and take its toll on your sexual activity. It isn’t surprising that it is also a trigger for depression in many people. Thankfully, some simple, nonsurgical ways can improve your condition and gain control over this otherwise potentially debilitating problem.3 What follows are some exercises you can do anytime, anywhere to help strengthen your pelvic floor muscles and regain proper control. Kegel exercises can strengthen your pelvic floor strength, improve bladder function, and possibly even completely eliminate leakage. This helps work the “fast twitch muscles” and the contractions are short or quick. These muscles help to quickly close off urine flow, avoiding leakage. Quickly tighten your muscles, lifting them up, before releasing immediately. Contract the muscles as you breathe out. Repeat this quick contraction. On an empty bladder, tighten the muscles gradually and hold for about 5 seconds. Then relax for 5 seconds. Build up to 10 seconds for both holding and relaxing over time. At first, you may only manage 1 or 2 seconds, but don’t worry. Ensure you don’t flex the buttocks, thigh, or abdominal muscles. Only your pelvic floor muscles must be engaged. Breathe freely through both tightening and loosening. Exhale as you still hold that abdominal contraction, raising your hips off the floor by contracting your glute/buttock muscles. Use your heels to stabilize yourself. Don’t overreach with your hips because it will cause your back to arch too much. 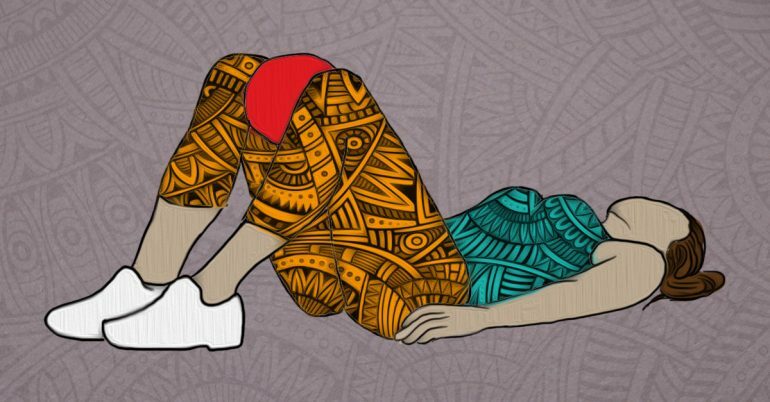 Lie down on your back with your knees bent and feet flat on the floor. Place a ball or pillow between your knees, supporting it so it doesn’t slip or fall. Inhale relaxing your pelvic floor. Exhale as you draw your pelvic floor muscles up and in, gently squeezing the ball as you do so. Ensure your tailbone is in contact with the mat/ground as you hold your contraction. Hold it for a few seconds and build up to 5 seconds or more as you did with the regular Kegels. Release the contraction. Follow this with normal relaxed breathing. Lie on your back with a ball held between the knees as before. Gently squeeze the ball and feel your pelvic floor muscles contract as you do this. Now move your arms above your head, palm side up. 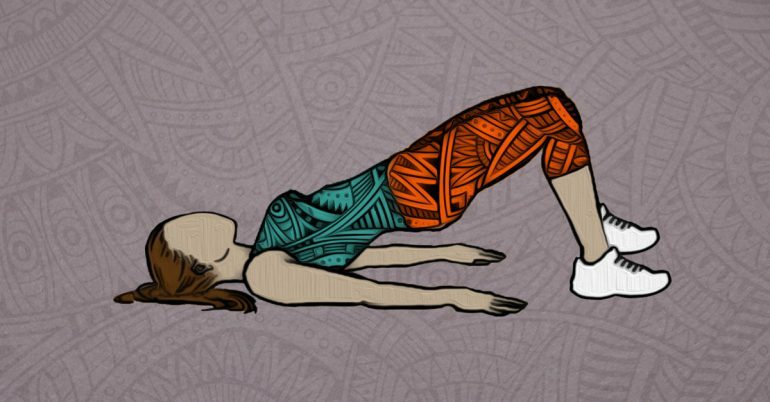 Exhale as you raise your hips off the ground to create the bridge position. 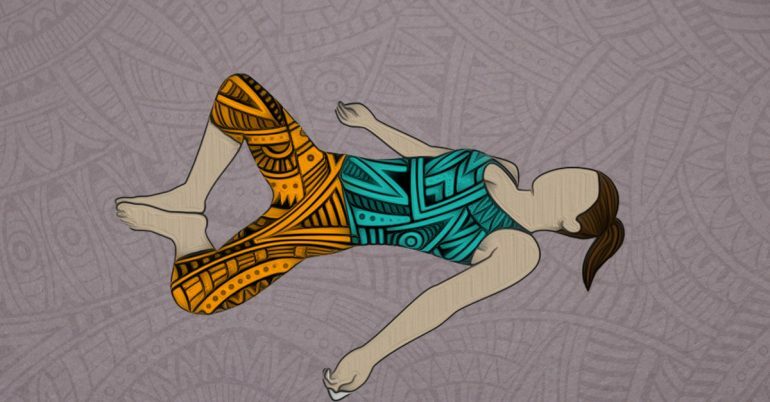 At the same time, move your arms up to the ceiling and bring them to rest on either side of your body, on the mat. Breathe in, bringing your torso back down followed by your hips. As you do this, lift your arms up and reach overhead with them. Squat on the ground bringing your feet as close together as you can manage. Move your thighs a little further apart so they are wider than your torso. Breathe out as you lean your torso forward. It should fit between your thighs snugly. 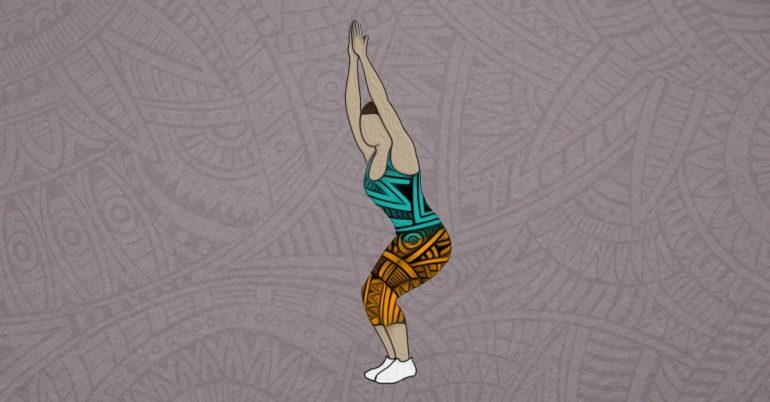 Press into your inner knees with the elbows and bring your palms to each other in salutation. Lengthen your front torso. Next, if you want to deepen the pose, try and press your inner thighs to the sides of the torso. Simultaneously, reach your arms ahead, swinging them to either side and fit your shins into your armpits. Let your fingertips press into the ground or clasp the back of your heels with them from the outside of your ankles. Hold this position for 30 seconds and work up to a minute over time. 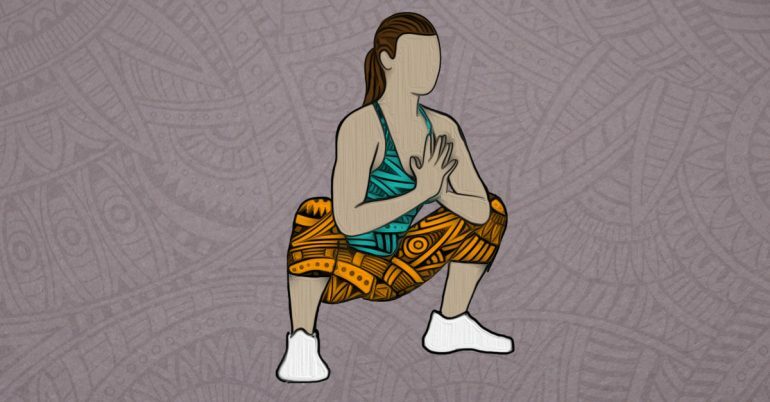 Breathe in as you straighten your knees and stand. Lie down on your back, knees bent, and feet together. Breathe in relaxing the pelvic floor. Feel your hip and abdominal muscle (transversus abdominis) relax. Allow your knees to drop open at the sides of your body. 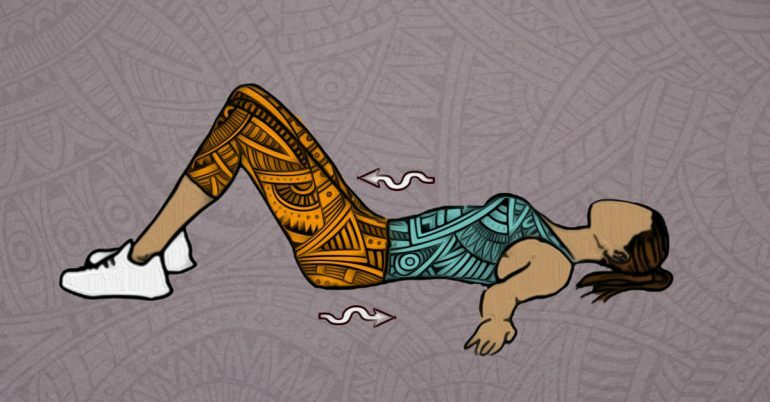 Breathe out as you bring your knees back to the start position, pulling your abdominal muscle in and lifting your pelvic floor. Accentuate that contraction of your muscles at the tail end of your exhalation. Begin in tadasana or mountain pose, standing with your feet together. Align your head, pelvis, and torso so that the centers of your head and pelvis line up. Inhale raising your arms up, palms facing each other until they are overhead. Exhale, keep your arms extended as your interlink your fingers and invert them to face the ceiling. Stretch your arms a little more. Continue to breathe. Extend a little more with each exhalation. 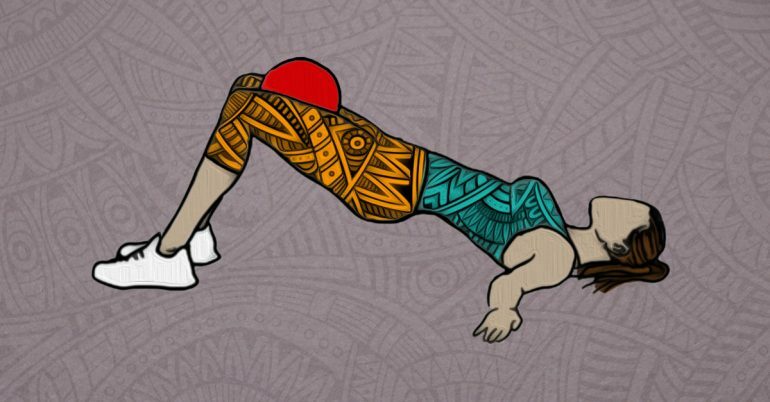 As you exhale, bend your legs deeply, with your inner thighs, knees, and feet still firmly glued to each other and heels flat on the ground. Let your lower spine open and rotate your pelvis back. Stop moving the pelvis as soon as you feel a contraction in your pelvic floor muscles. Now focus on the lower abdominal muscles that are just above your pubic bone and gently draw them in. Next, contract your pelvic floor muscles as you do in a Kegel, to stop the imaginary urine flow. Hold for multiple breaths and then release. Return to the original position. 1, 3. ↑ Urinary Incontinence and the Benefits of Exercise. American College of Sports Medicine. 2. ↑ Bladder Control Problems in Men (Urinary Incontinence).The National Institute of Diabetes and Digestive and Kidney Diseases. 4, 5, 6. ↑ What Are Kegel Exercises?. National Association For Continence. 7. ↑ Taylor, Louise. Woman’s Book of Yoga: A Journal for Health and Self-Discovery. Tuttle Publishing, 1993. 9. ↑ Patient Exercise Book.University of Michigan Health System. 10. ↑ The Pilates Ball Core-strengthening Workout. American Council on Exercise. 11. ↑ Wieland, L. Susan, Nipun Shrestha, Zohra S. Lassi, Sougata Panda, Delia Chiaramonte, and Nicole Skoetz. “Yoga for treatment of urinary incontinence in women.” The Cochrane Library (2017). 12. ↑ Garland Pose. Yoga Journal. 13. ↑ 4 Yoga Poses To Help Beat Your Sneaky Leak.Prevention. 14. ↑ Invite Quiet.Yoga Journal Nov 2008. 15. ↑ Ask our expert.Yoga Journal Nov 2003. 16. ↑ 10 ways to stop leaks. National Health Service.